At the age of 38, Warren De Stefano was facing the end of a 25-year career as a production specialist at the New York Times. He saw how technology was significantly changing the landscape of that field -- and knew it was only a matter of time before his job was going to be cut. Married with three children, De Stefano says he knew at that critical time in his life that he'd only have one shot at getting the unavoidable career chage right. He took it upon himself to take control of his professional career and began looking into franchising. And it was the uniqueness of the Retro Fitness gym concept that won him over. "I had been working out at various big-name gyms for years, but when I walked into a Retro Fitness, I was in awe," he says. "The colors, the liveliness, the atmosphere, the movie theater, the juice bar -- it made me want to go to the gym." 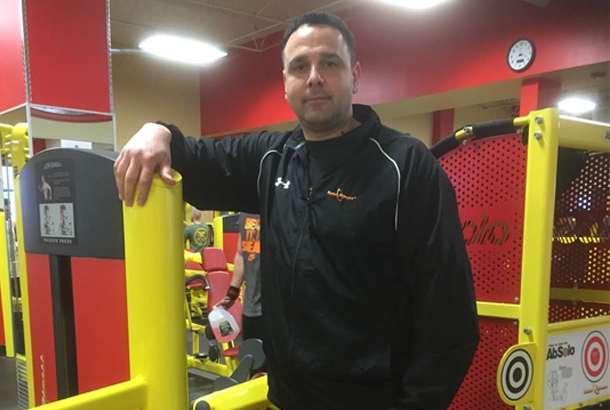 De Stefano, his father and brother took leans on their homes to raise capital, and he partnered with another Retro Fitness franchisee to invest in gyms together. Today, De Stefano and another franchisee collectively own five Retro Fitness gyms in the New Jersery / New York City Metro area. and he is personally invested in three of the gyms. De Stefano has also made efforts to support local wounded military veterans through his franchises. In late 2014, he and his partners invested nearly $190,000 to install a handicap ramp at one of their gyms. The ramp took five months to build, and De Stefano and a few partners didn’t take a paycheck home for some time in order to make it a reality. In addition, since the ramp was unveiled, De Stefano's gyms have offered all amputees, paraplegic and quadriplegic military veterans a free lifetime membership to his Retro Fitness locations with free personal-training sessions included. Franchise owned: Five Retro Fitness locations throughout New Jersey and the New York City boroughs. Two are open, one is under construction in pre-sales, one just signed a lease, and my partner owns the other location that is in operation within our group. We opened our first location over four years ago in Clark, New Jersey. I realized that I had to switch careers. It had been almost two decades since I completed schooling, so I knew I needed help. That’s why I decided to get into franchising. They really lay down the ground work and have the systems in place to be successful. I didn’t want to start from scratch -- I was 38-years-old, married with three children. At that point, you have only one shot to make it. I had been a production specialist at the New York Times for over 25 years. Every year, I saw the circulation getting less and less, and they kept cutting down more and more jobs. There was no way I was going to work another 25 years in this industry. My main goal was to get into an industry that would always be in demand. I chose Retro Fitness, because I loved the idea of being in a gym business. I didn’t want to just make money, I wanted to help people. I thought: What can I do to change people’s lives and also earn an income to provide for my family? I chose the gym business and began looking around at competitors and realized that they weren’t real gyms. I visited one concept that offered free bagels and pizza to members. In fact, they had more people waiting in line for free food than they did on their cardio machines. The gym wasn’t really helping people work toward their health and fitness goals. I had been working out at various big-name gyms for years, but when I walked into a Retro Fitness, I was in awe. The colors, the liveliness, the atmosphere, the movie theater, the juice bar -- it made me want to go to the gym. It was like a happy place. The staff and members were friendly, and there was so much to do. If you wanted to watch a movie, you could do that in the Cardio Theater. If you wanted to watch TV, you could watch whatever show you wanted to on your own cardio machine. That’s when I knew I wanted to be a part of Retro Fitness. I partnered with my brother, Frankie, for my first gym. Together, we both put in around $270,000 to cover the franchise fee, attorney, security deposit for the lease and a 30 percent down payment on the Small Business Administration loan. We earned 100 percent of our investment back within 16 months of opening our first gym. To continue building the Retro Fitness brand throughout the New York City Metro / New Jersey area, I also began partnering with another Retro Fitness franchisee, Alberto Goncalves. He had already opened his own Retro Fitness location and also a Burger King franchisee. I noticed that he was one of the nearby Retro franchisees and asked if he wanted to team together. Collectively, our location count is now five franchise agreements. The International Franchise Expo at the Javits Center in New York City was very beneficial to my research process. You can walk around and speak with reps from many different types of franchise concepts that are all looking to grow throughout the Northeast. While I was there, I thought to myself: What can I see myself doing every day? The most important thing for me was to put in as little time as possible. I didn’t want to be married to a career. The biggest commodity to me in life is time -- you can never replace time. At my last job, I worked 70 hours a week, so I didn’t want to be locked into an 80-hour work week at a store. I was sold on a fitness franchise when I saw the amount of time that you can put in at a gym, meanwhile make a profit and still be home with your family and run it from your house. Beyond the atmosphere of the gym, what set Retro Fitness apart from other fitness concepts was their responsiveness. When I sent an email to Retro Fitness inquiring about the franchise opportunity, I received a response within 24 hours. When I emailed other concepts, it took them months to get back to me. Retro Fitness’ responsiveness made me feel like they truly wanted me to be part of their family. And, they literally held my hand through the whole process of opening. Hiring staff. Each Retro Fitness location needs anywhere between 10 to14 employees, and a majority of the positions are part-time work. I thought it would be easier to find people. What I found, is that you’re better off paying $2 per hour more to someone in their 20s than to hire and pay a teenager minimum wage. People in their 20s are more aggressive and want to work harder. For many, a great way to start a fitness career is behind the front desk of a gym, learning the system. There’s unlimited career opportunities in the fitness world -- from personal training to sports marketing -- and getting started in a gym and then branching out is a great way to get your foot in the door. Follow the process I did. Go to a regional franchise show, visit every booth and consider where you see yourself. What would you enjoy doing? How much time do you want to put into the business? These franchise shows are really the only place to see so many concepts all at once and talk directly to representatives. If you were to do it on your own, you would have to contact each franchise and that could take upward of a year. Also, once you find a franchise, call existing franchisees and talk to them about their experiences. When I began looking at Retro Fitness, another thing I looked at was how many franchisees own multiple units. If someone owns a franchise and isn’t happy, they’re not going to open more. If you see someone who owns three or four units, it shows that the first one worked, and they’re happy with the franchise. I have one gym under construction in Brooklyn and one that recently signed a lease in Queens. My realistic goal is to open a new Retro Fitness every two years.